People want to know how to hem pants. How do I know that? I'll tell you in a minute. 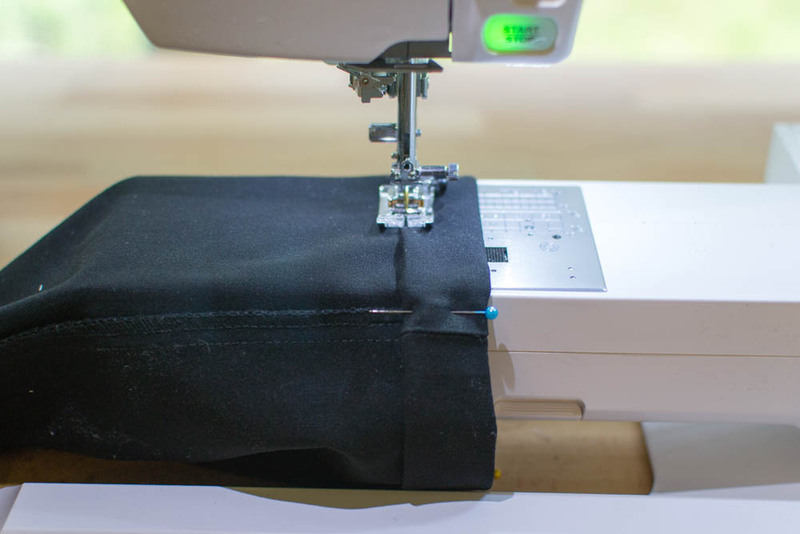 But first, let's be clear - this post will show you how to hem pants the quick and easy way with any sewing machine. It's not fancy. You can see the stitching (so this is not for $400 dress pants). It's basically the same hemming that you'll pay $10 for at an alteration shop - perfect for work pants, scrubs, or jeans. Are you ready to DIY hem your own pants (or your kid's pants)? I know you are. thread the same color that matches the topstitching on your jeans. 1. Pin the pants to the correct length. It goes without saying, the owner of the pants should be wearing them (with shoes) so you can get the length just right. And 'just right' can be different for various people. One lady I helped wanted her jeans to skim the floor when she was wearing heels. Make sure you have a mirror handy (near the floor) so the wearer can see the length. Never trust people who simply say 'hem them 2 inches,' or 'my inseam is 30 inches.' Always pin and let them see how the pant legs will look. 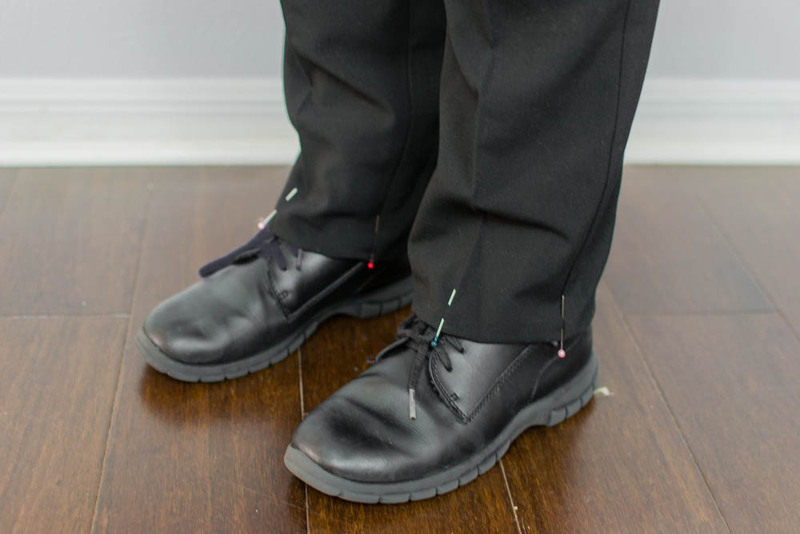 As you can see in the photo above, I like to place the heads of the pins at the bottom so I can easily grab them when the pants are inside out. Have the wearer take the pants off. With the pants inside out, check to see if the inside cuffs (the amount to hem) is the same on both pant legs. Minor adjustments are okay here. If you like, you can have the wearer try them on again before you proceed. 2. Press the new pants hem. Move the pants to your ironing board before you remove the pins. Press well around the leg so you'll be able to easily see the crease later. Tip: Cotton pants (like jeans and scrubs) can take high heat. 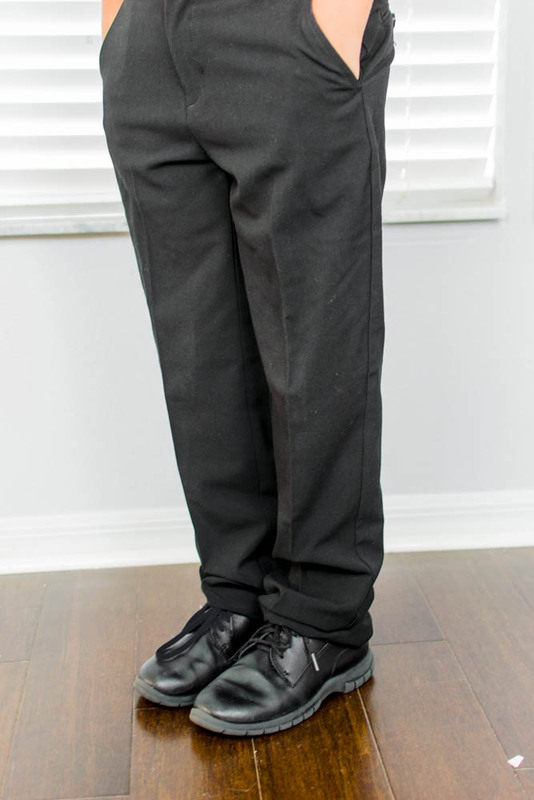 Dress pants that contain rayon or polyester should be pressed on the medium setting. Always test in an inconspicuous spot first. 3. Cut away the extra length. Measure and cut the pant leg off 2'' below the crease that you pressed. To be super accurate, you can use a hem gauge and carefully mark 2'' below the crease all the way around. I like to work fast. I simply mark the crease with my tailor's chalk (so I can clearly see it through the ruler), and then slice the pants 2'' below the crease. If the pants need to be hemmed less than 2'', you can measure and cut a narrower hem (1'' to 1 1/2'' is okay too). You will be pressing the bottom edge to the inside twice the same amount (1'' in the example above). 4. Fold and press the new hem. 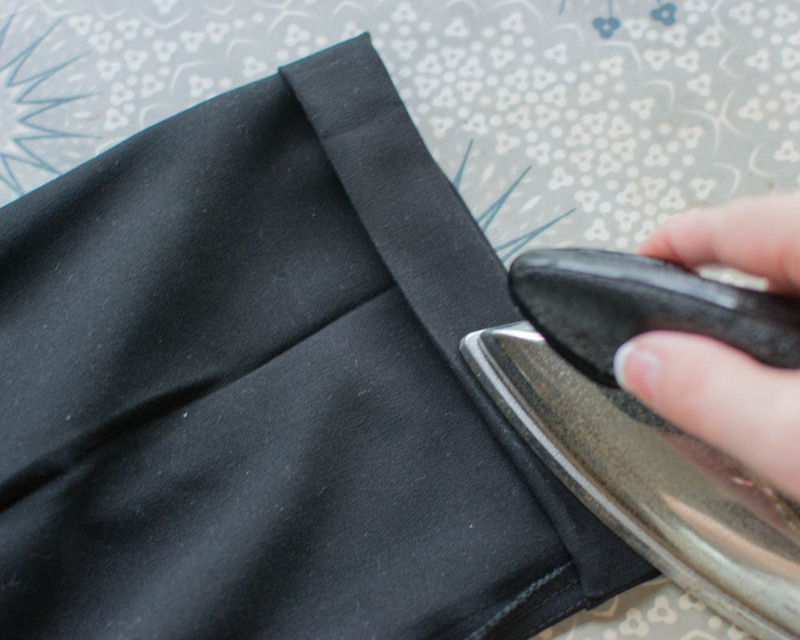 Here's a tip to help the hem fold nicely at the side seams: Clip into the seam (without cutting through the entire seam allowance) at the hem line, and halfway to the cut edge. Repeat on both sides of the pant leg. As you fold the hem, push the middle piece of the seam allowance in the opposite direction as the other two. Press the new hem well. Pin if desired. 5. Sew the hem close to the folded edge. Almost every sewing machine these days has a free arm (sometimes you have to remove a 'table'). With the pants still inside out, place the leg around the free arm of your sewing machine. Set it to a straight stitch, medium stitch length. Sew close to the folded edge all the way around. Believe it or not, the sewing part takes less than a minute. Careful measuring and pressing leading up to the sewing will set you up for success!